2015 has been a good year for Ashley and I on a personal note. Ashley and I moved from Mission Viejo to Monrovia toward the end of 2015, Ashley started a new job teaching at Gladstone High School, and we have been house shopping as of late. The end of 2015 has been exceptionally busy, which has taken a toll on our post here in the last several months. Regardless of this temporary busy season towards the end of 2015, readership on our blog has continued to grow. This year we added 4 new hikes as well as updated many previous hikes from years past, including Mt. Whitney and multiple associated training hikes up Mt. Baldy and Mt. San Gorgonio. 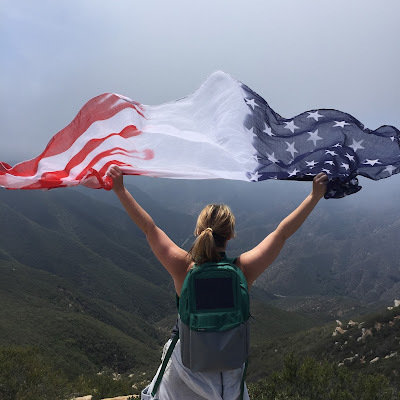 We have over 144 different hiking trails (Specifically 68 trails in the Orange County Area, 36 in the greater Southern California Area, and 45 outside of the greater Southern California Area) that are detailed on Brian and Ashley's Hiking Blog. The number of fans who like our Facebook page has steadily continued to grow, with now over 990 likes and we now have over 212 twitter followers. Ashley and I always enjoy all the comments/feedback that we get from our readers about the hikes that they have done. Your comments, stories, and feedback continue to make this blog better and is always welcome! Ashley and I want to say a special thanks to ALL our readers and we hope that 2016 is a great hiking year for you and that you have a Happy New Year! Our goal for the next year is to continue hiking new and exciting trails as well as re-visit many of our favorite hiking locations. Ashley and I want to wish you and your family a happy and prosperous 2016! Happy Trails!